Planning your season's viewing? Travis Lazarczyk gives you 10 of the best contests this fall. Between Friday and the last week of October there will be approximately 128 high school football games featuring central Maine teams. There’s no way you can go to all of them. Assuming you have no specific rooting interest, here’s 10 can’t-miss games, one each Friday night of the regular season, plus a couple Saturday games sprinkled in for good measure. Can defending Class B state champion Cony replace Fitzpatrick Trophy winning quarterback Ben Lucas, wideout Jonathan Saban and offensive lineman Isaac Gingras, among others? Will Messalonskee continue to improve in its second season under head coach Brad Bishop? Go to Cony’s Alumni Field on Friday night and find out. Waterville and Winslow are the top two contenders in Eastern Class C this season, but if you want to add a third team Foxcroft Academy is a strong choice. The Ponies and Purple Panthers played one of the best regular season games in the conference last season, won by Waterville 20-19 after it stuffed a Foxcroft 2-point conversion try with just under two minutes to play. New Mt. Blue head coach Jim Aylward has coached high school football in Maine for decades and there’s not much he needs to cross off his coaching bucket list. Coaching his team at Lawrence’s Keyes Field is one of them. Aylward coached for years at Mountain Valley in Rumford and never had the chance to bring a team to Fairfield. Pine Tree Conference Class B is the most competitive, balanced league in the state. This could be one of the games that helps form the playoff picture. I know, Brunswick and Cony play a rematch of the PTC B championship game at the same time. But this has the potential to be The Game of the Little Ten Conference regular season. Last year, Bucksport and MCI played one of the most entertaining high school football games you could ever want to see, a 42-35 Bucksport win. Just two and a half minutes into the game, the score was tied 14-14. The Bucks pushed their lead to 35-14 before the Huskies rallied. Like last season, Bucksport and MCI look to be among the top teams in the LTC. The winner of this early season game could have the best shot at the top seed in the playoffs. Cony and Lawrence are the last two conference champions. When they meet at the end of the month, it will be a good midseason test for two teams that expect to contend in the PTC B. For a long time, this was the biggest rivalry in Eastern Class B. Either Winslow or Belfast represented the region in the state championship game in 12 of the 15 state championship games from 1992 to 2006. That’s ancient history, of course. Current Belfast players were in grade school the last time the Lions played in the state game, in 2003. That said, these are two of the better teams in the league, and while the rivalry isn’t what it used to be Winslow and Belfast should both be fighting for playoff position when they meet. This was the game that set up Messalonskee for a strong second half last year. The Eagles pulled out a 21-14 win at Brunswick. The victory ignited a five-game win streak for Messalonskee and was Brunswick’s only PTC loss of the regular season. As is the case every week in the PTC, playoff spots will be on the line. 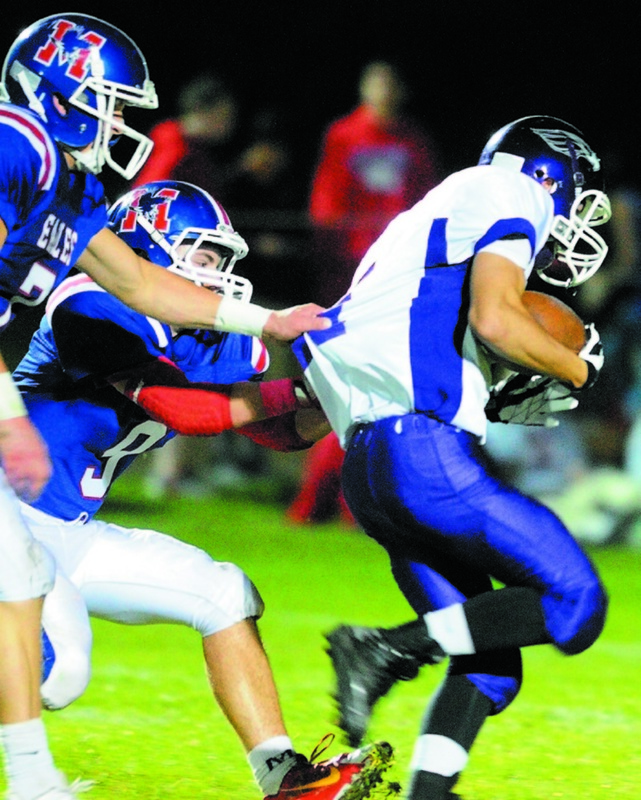 Waterville’s Dan Pooler ran for 305 yards against MDI in the playoffs last season. This game features two of the best running teams in Eastern Class C, so if one game on the schedule could be old-fashioned smashmouth football in this day of the spread, this is it. This is Rivalry Week, Part 1. Through a quirk in Eastern C scheduling (that quirk being lousy, lazy scheduling), the Battle of the Bridge will be the next-to-last game of the regular season, not the finale. Oh well. No matter when this game is played, it features the two frontrunners in the region. Winslow and Waterville played twice last season. Waterville won the regular season game when the Panthers scored with 20 seconds left to take a 25-21 win. Waterville’s game-winning score came 24 seconds after it appeared the Black Raiders scored the game-winning touchdown with 44 seconds left. Winslow won the conference championship game a few weeks later in a rout, but there’s no doubt the rivalry is as strong as it’s been in years. This is Rivalry Week, Part 2. When Mt. Blue moved from Class A to Class B a few years ago because of its declining enrollment, this rivalry went away. Last season, with the advent of the four class system, it was back, and it was back in a big way. Mt. Blue beat Skowhegan in the regular season finale to clinch a home game in the first round of the playoffs against… Skowhegan. The rematch a week later in Farmington went back and forth, until the Indians scored late to take a 36-29 win but it wasn’t sealed until Skowhegan’s Nate Morris intercepted a pass at the goal line with 9.2 seconds left.